I have recently become a member of a Facebook group called Crazy about Cross Stitch. Through it I have found a blog called The Eclectic Bloke's Stitching Blog. 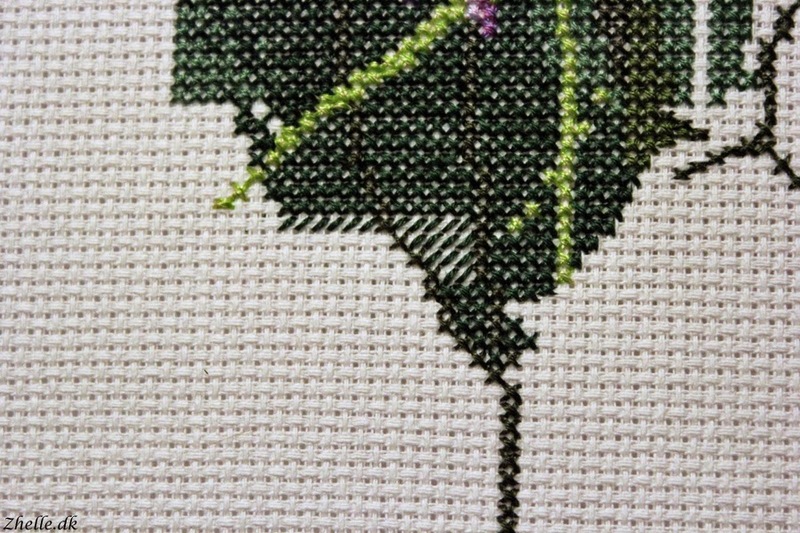 In a post from today, he describes how his partner cross stitches: He does a whole block of half stitches and then he starts again with the other part of the stitches that makes out the cross. I thought "How a cool way to do it, haven't seen that before!" and kept that thought until I looked a bit closer at the design I am stitching myself at the moment and realised that I do sort of the same! The stitching above was me running out of thread and then starting somewhere else instead. At the bottom of the picture you can see the top of a stem, and I used the same technique there so I was sure I didn't have to end the thread in the middle of a blank piece of aida. I don't use that technique to the same extend as he does here, but I still think it is fun, that sometimes we don't realise, how it is we do things! This is how far I have come so far. I have filled in a lot of blank holes in the middle of the areas I have already stitched, so it is starting to look more complete in that area. I am far from completing it though! I am quite a slow stitcher I think, but I have done something to speed things up a bit. I will show you that next week! 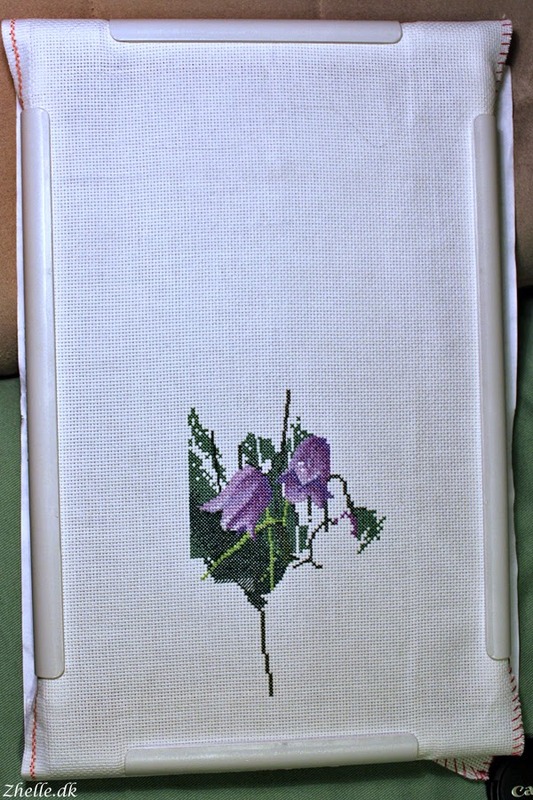 Until today I have stitched it using my little Q-Snap frame. I have used a combination of the big and little frame on my "Flying the Flag"-project, and I am not sure why I haven't done the same on this one before today! Maybe because it just shows how little I have stitched so far. Ah well. I have reached three of the four edges on the embroidery now. The bottom one and the two sides have both been reached. It is most obvious on the left side whereas on the right side and the bottom I have only reached the edges with a stitch on both. The right side is going to be a lot more distinct soon! I am going to stitch this whole page of the pattern before I continue to the top part of it, so it will be a while before I can see how big it is actually going to be. 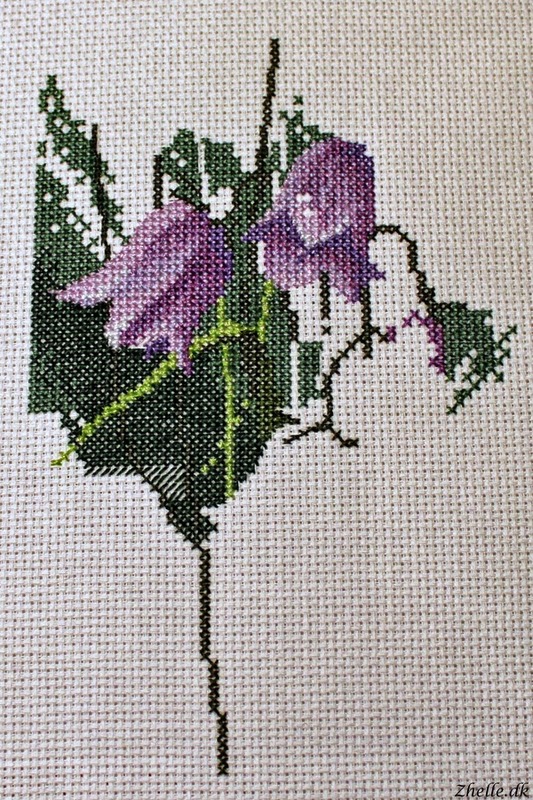 I am loving it so far though, harebells are one of my absolute favourite flowers! Have you started on any beautiful summer designs yet?